YELLOWSTONE NATIONAL PARK, Wyo. (CNS) — Jesuit Father Rick Malloy very much enjoys summers in Yellowstone National Park. But exceptional fishing is not the main thing that brings him to Wyoming summer after summer. He said it’s the privilege and beauty of park ministry that keeps him coming back. Father Malloy is a cultural anthropologist, professor and chaplain at the Jesuit-run University of Scranton in Pennsylvania. For the past seven summers, he has gone west to minister in Yellowstone, do some writing and, of course, fish. Catholic News Service caught up with him in early August, one of the park’s busiest months. It was a late Saturday afternoon, and Yellowstone’s Canyon area was teeming with people. A steady stream of cars and RVs made its way into Canyon village. Father Malloy, dressed in black clerics, a jean jacket and a baseball cap, hopped out of a red SUV and placed a sign along the roadway. 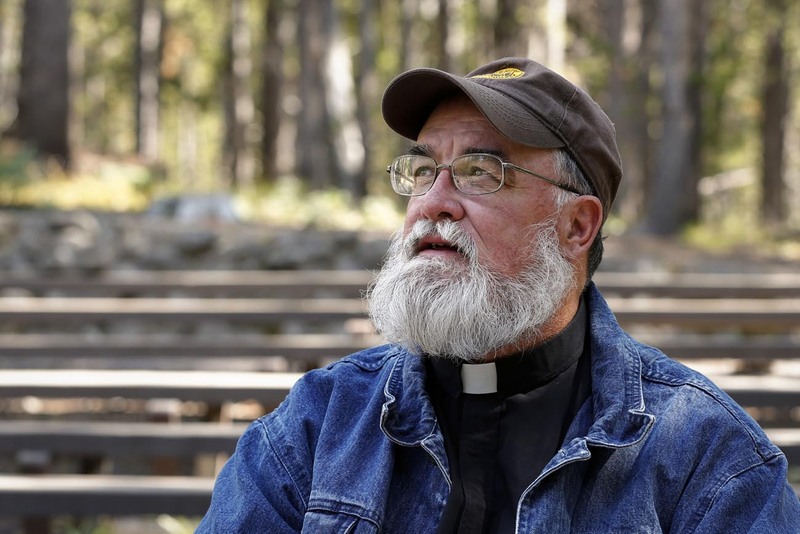 It read, “Catholic Mass,” and pointed to the campground amphitheater, a clearing where a small folding table, wooden benches and surrounding stands of lodgepole pines serve as a makeshift chapel. The air smelled of pine, fallen rain from a day earlier and campfire smoke. The priest set up a tiny altar with the help of Dan and Kathleen Golder, parishioners of St. Anthony of Padua Church in Cody. The parish coordinates the Catholic ministry in Yellowstone and its parishioners do what they can to assist. “Actually, we’re just here to keep an eye on Father Rick,” Kathleen joked as she held up a bag of hosts to be consecrated for Communion. “What’s your number, Father?” she called out, referring to what number of hosts would be needed. The two quickly determined that there would be 40 or so Massgoers, maybe half as many as the previous Saturday. After setting up, Father Malloy and the Golders had some time to spare and their conversation turned to news about St. Anthony parishioners and good fishing spots. Yellowstone is among America’s best-loved national parks. Its 3,500 square miles of wilderness showcase the world’s largest collection of geothermal features, including its remarkable geysers. Roaring waterfalls, crystal-clear lakes and a great diversity of wildlife are big draws for recreational visitors. Priests have been coming into the park to celebrate Mass since the 1920s when yearly visitors numbered less than 200,000. Today, with 4.1 million annual visitors, Yellowstone has the potential for more than 600,000 Catholic vacationers a year. 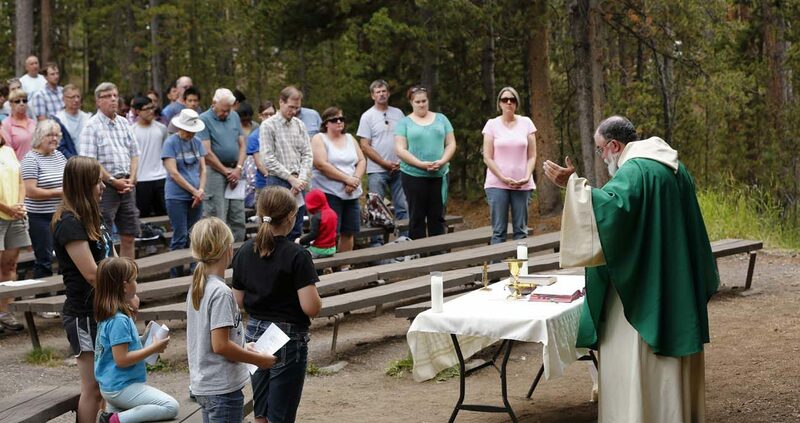 Catholic services — Mass if a priest is available and Communion service if one is not — are held Saturdays at the Canyon campground, and Sundays at Yellowstone Lake Lodge and Old Faithful Lodge mid-June through mid-September. St. Anthony’s, the nearest Catholic church to much of the park, is a two-and-a-half-hour drive from Old Faithful, and that’s if traffic in the park is moving. Father Malloy waits several extra minutes before he starts each Mass. He knows there could be people stuck in a buffalo jam. The omnipresent bison have the right-of-way on park roadways and often cause rubbernecking delays. When the priest got started this day, he broke the ice with a quip. Members of the visiting congregation shouted out their home states: Wisconsin, North Carolina, Oklahoma, Minnesota, Florida, California, South Dakota, Pennsylvania and other places. About 75 showed for the Mass, surpassing what the priest had expected. Among them were retirees John and Elizabeth Crawford, full-time RVers and park volunteers originally from New Jersey; Charles and Kay Tubbs of Arcata, California, campground hosts and trail volunteers who first visited Yellowstone in 1965; and Amie and Kevin Heinlein of Ionia, Michigan, visiting Yellowstone for the first time with their three children. Father Malloy said giving a homily in Yellowstone National Park is like preaching to the world. The Heinleins, who thought they might have to travel to a nearby town for Mass, were surprised to learn of the campground service. “This was absolutely wonderful,” Amie Heinlein told Father Malloy as he greeted her family at the end of the service.